OK, firstly, finding pics of this kind of stuff that give a good view of the item but are not X-rated is not so easy. 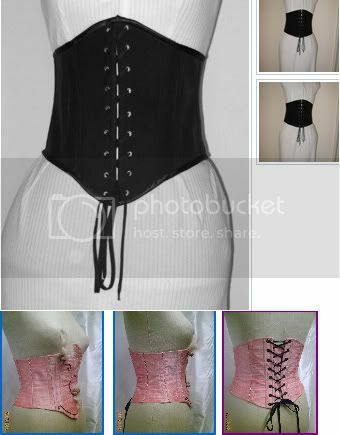 Est-ce que cela pourrait être ça : http://en.wikipedia.org/wiki/Waist_cincher ? I think this is what we English refer to as a 'waspie'...not sure why! Waspie... wasp...? Over here, having a waist like a wasp's is having a really small/thin waist, and Wikipedia says that 'wasp waist' refers to a silhouette, so 'waspie' makes sense for me. *waves back* Glad I could help! And thinking about a wasp, it's body is in two segments and the 'waist' part is extremely thin so yes, it does make sense! I'm back from my little break and starting to catch up...slowly!! Hope you had a great Bastille Day, sweetheart! A four day weekend should happen every weekend, shouldn't it?!! But glad it was good.